The following information is intended to give a brief overview of the key elements to consider in ensuring your windows and doors are secure. As a general rule, windows and doors are transported to site unglazed. The installers first install the frames, and then they put the glass in once the frame is in place. The glass is held in place by the glazing bead, which clips into the frame. In the event that the glass is broken in the future and needs to be replaced, the glazing bead is removed, the glass is replaced and the glazing bead is clipped back in place. Some windows and doors have the glazing bead on the inside and some have the glazing bead on the outside. Both options can be made perfectly secure, but it is worth checking with your supplier that have taken the appropriate measures. 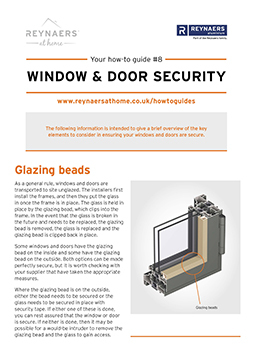 Where the glazing bead is on the outside, either the bead needs to be secured or the glass needs to be secured in place with security tape. If either one of these is done, you can rest assured that the window or door is secure. If neither is done, then it may be possible for a would-be intruder to remove the glazing bead and the glass to gain access. No matter how well the window or door are made and how secure the locking mechanism may be, if someone really wants to gain entry they can always smash the glass. Fortunately this tends to be quite noisy, and this is enough to put many intruders off. One way to safe guard against this is to specify laminated glass. Laminated glass comprises two sheets of glass sandwiched around a thin layer of (usually) polyvinyl butyral (PVB). This lamination process is done under heat and pressure, making the PVB act as a type of glue to stick the two sheets of glass together, creating one clear pane. Not only does laminated glass have a higher impact resistance, if one or both of the panes of glass do break, the pieces of glass remain stuck to the PVB interlayer. An intruder who is determined enough to keep hammering away at the glass will be able to make a hole in the PVB and may be able to get in eventually, but it will take a long time and all the hammering will create a lot of noise. Most intruders will give up when they realise the glass is laminated. Particularly for uPVC windows and doors, if the hinges and locks are screwed just into the plastic of the window frame, there is a possibility that the screws can be torn out from the plastic with relative ease. For this reason, the better uPVC windows and doors place steel plates inside the plastic profiles and the screws are secured through the plastic and into the steel plate. Windows and doors are only as strong as their weakest point. Many modern windows and doors have multi-point locking systems that secure the opening side top and bottom and at two or three points in between. The hinge side is sometimes over-looked, however. Some windows and doors have additional brackets on the hinge side that provide additional security in securing the window or door leaf to the outer frame when closed. Most modern windows and doors are fitted with multi-point espagnolette locking systems whereby a turn of the handle engages or disengages all locking points at the same time. Strictly speaking a multi-point locking system can be any locking system that has more than one latch or locking point. The better systems are likely to have shoot-bolts at the top and bottom and a combination of hooks, latches, mushroom cams and/or roller cams along the opening side of the window or door. These locking points should ideally move in opposing directions. There are still a few windows that are fitted with the older style cockspur handles even though they offer lower levels of security. The main reason for doing this would be to get a more traditional style of handle, like the monkey tail handle for example. If you like this more traditional route, it might be worth a quick phone call to your home insurance company just to make sure your cover is not adversely affected. Hardware is a general term for the hinges, handles and locking mechanism. As a general rule, stainless steel hinges and locking systems are likely to be more durable and offer higher levels of security than hardware made from other alloys. Any window or door is only as secure as its weakest point. If it is not installed correctly, in the worst case, it may be possible for an intruder to actually remove the whole window or door including the outer frame from the wall. Fortunately it is not rocket science! Check that the installer is using screws that are long enough and thick enough to anchor the window or door frame into the wall. For windows and doors there should be at least two screws on each of the four sides, and as a general rule, on each side you might expect the screws to be within 200mm of each corner and then no more than every 700mm along each side. Patio doors of the 1970s earned a reputation for being insecure – intruders would prise up a door leaf with a spade and lift it out of the frame. Fortunately, the design of patio doors has come a long way since then, and the better quality doors will all be designed with anti-lift devices to stop this from being possible. The design of lock cylinders has also seen a lot of development over recent years. As intruders find new ways of gaining unlawful entry (like picking, bumping and drilling), so the lock cylinder manufacturers have developed new products that are designed to thwart these efforts.